As the popularity of locally produced craft beers continues to rise, two Hendricks County brewpubs are bringing their taps to a most unique place -- a local library -- to host a beer tasting event from 3-5 p.m. this Saturday, Oct. 11. Billed simply as the 3rd Annual Beer Tasting Fundraiser, the event will take place at the Plainfield-Guilford Township Public Library, 1120 Stafford Road. Black Swan Brewpub and Three Pints Brewpub will participate in the event, and both establishments are located in Plainfield just off I-70 at the Plainfield exit. Tickets to this one-of-a-kind event are $8 each or $15 for a pair and can be purchased at the door on the day of the event. In addition to the samples, there will be lots of snacks, a presentation on craft brewing and chances to win beer-related prizes - including a wooden six-pack carrier! While you&apos;re there, you can also test your brewing knowledge as part of a beer trivia game. You&apos;ll even be able to make a pretzel necklace to help cleanse your beer-tasting palette. 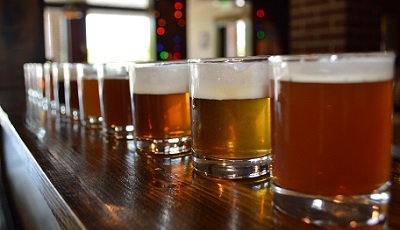 And, whether you consider yourself something of an expert when it comes to locally crafted beers or you just enjoy the opportunity of trying something new...you&apos;ll enjoy the chance to try up to five different brews from each brewer. Their knowledgeable staff also will be on hand to share what they know about microbreweries. This event is for adults age 21 and older only, each person attending must be registered separately, and photo ID&apos;s will be checked at the door. To save your spot, don&apos;t forget to register in advance as spots are limited. For more information, click here or contact Joanna Carter at (317) 839-6602 x2159 or Kate Bragg at (317) 839-6603 x2119.